This advanced strawberry-picking robot is able to pick individual strawberries right off the plant. Not only that, this little robot can distinguish the red, ripe strawberries and pick only those that are ready. It uses two cameras to determine the location of the strawberry in three dimensions, and then goes after it. It's not one of those sluggish robots, either; it can pick a berry every nine seconds. And best of all, it doesn't eat any of the berries, unlike myself and the members of my family when we go strawberry picking. 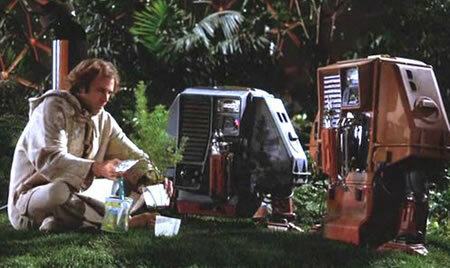 Fans of the 1972 movie Silent Running will also remember (as Peter Jacobs did in the comments) that Bruce Dern took tended his garden with the help of robots.